A delicious breakfast bread. Try it toasted with butter. Melt margarine in a saucepan, set aside. In a large bowl dissolve 1 tsp sugar in the water. Stir in yeast and let rest 10 minutes, or until foamy. Wire whisk in milk and dark brown sugar. Beat until smooth. Add 2 cups bread flour, the salt, bran and wheat germ. Mix with a wooden spoon until smooth. 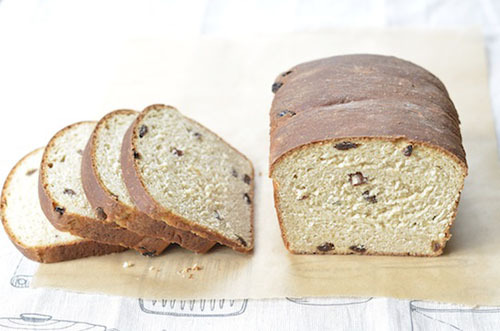 Fold in the melted margarine and raisins. Add one more cup of flour to the dough, beat in. Gradually add what you need of the last cup of flour with your hands, pressing flour in, turning dough over until it is fairly stiff. Cover and let rise 40 minutes. Sprinkle dough with 2 tbsp flour. Punch dough down. Place on a floured surface. Press out to a 1-inch thick square. Cut into two equal pieces. Roll each piece up and seal the edges. Place in two oiled loaf pans. Cover and let rise until double, about 1½ hours. Bake in a preheated 375°F oven for 40 minutes. Cool on racks. Can we add cinnamon and if so, how much? Yes, you can add cinnamon. The amount really depends on your taste. I would recommend starting out with 1 tablespoon, and go from there. do you use wheat bran or oat bran in this recipe? You can use either, depending on your taste. The oat bran has a more neutral flavor than the wheat bran.